This week Sunday Supper is being hosted by Crazy Foodie Stunts and he has chosen the theme, Vegetables as a Main Dish. Thanks DB for choosing such a versatile and fun theme. I could make vegetables my main dish every night but unfortunately my family does not feel the same way. So when I want to give them a meatless meal, I often turn to pasta. However, I think that would make pasta as the main dish. There are some exceptions that my family will not only eat but enjoy and sometimes even request. 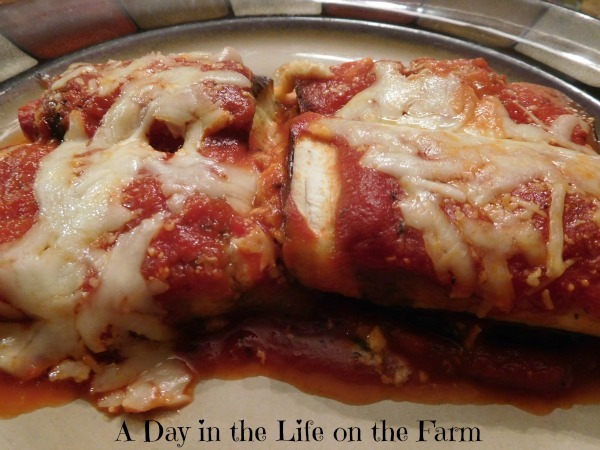 Eggplant Rollatini is one of those dishes. It is basically Monicatti using thinly sliced eggplant in place of the noodles. I also add a little lemon zest and chili paste to the filling, the lemon brightens the dish and the chile gives it just a tiny bite. The recipe I am sharing serves 2 but you can easily double or triple the recipe with great results. 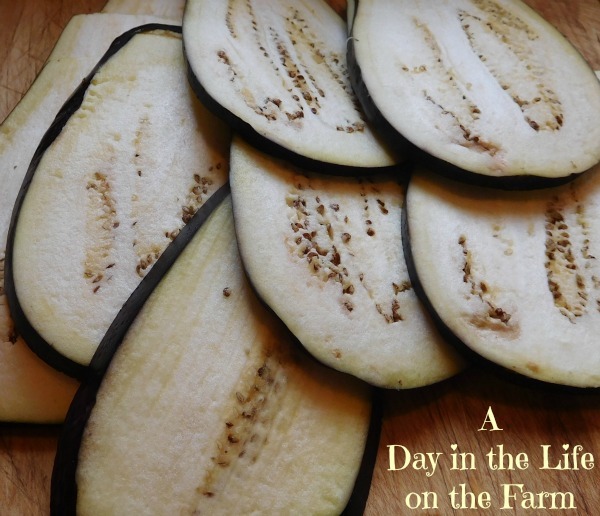 I use a mandolin to get even, thin slices of eggplant. Then I blanch the eggplant to make it pliable. Place some marinara in the bottom of your baking dish. Roll the eggplant around the filling and nestle them in the dish. 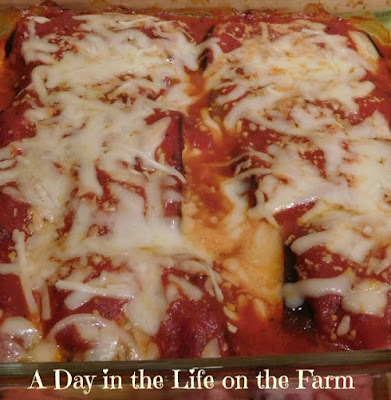 Top with more sauce and sprinkle with extra mozzarella and parmesan cheese. Bake in a hot (400*) oven for 20 minutes. I guarantee your family will not miss the meat. Bring a large pot of salted water to a boil. 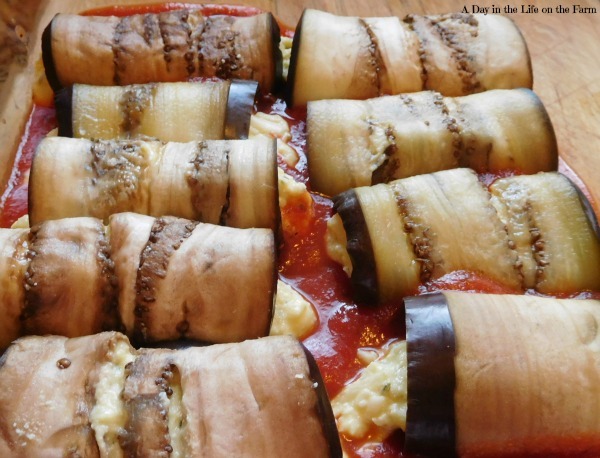 Place eggplant slices in the boiling water for 2-3 minutes. Remove from the boiling water onto a paper towel lined baking sheet and blot completely dry with additional paper towel. Set aside. Combine remaining ingredients except for marinara sauce in a small bowl and stir with a spoon until well combined. Set aside. What a fun idea. Delicious too! Looks like a great recipe for the younger kids to participate in making. Yes it would be fun to have them help roll them up. My kids were all grown before I began making this recipe. I definitely need help with incorporating my veggies into my diet so I'm in love with this week's Sunday Supper theme! 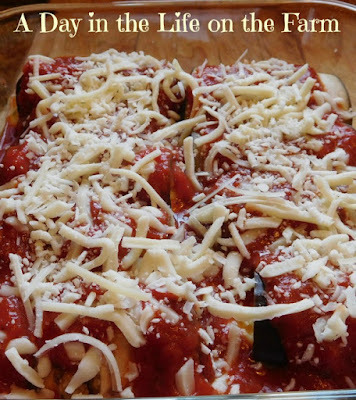 Your eggplant rollatini looks delicious, especially smothered in all that ooey gooey cheese. Yep, best of both worlds Nancy. Can never go wrong with Italian! Yup, we both had a yummy idea for the veggie theme :) This looks much better using the large eggplant like you did---I'll do that next time!!! Yes, I haven't had the problem you had with the skin so maybe it is the different type of eggplant. I love eggplant! This sounds fantastic. I'd be happy to have this for dinner any night! Chili paste sounds like a great way to spice it up! Thanks Cindy, I add just a touch but you can adjust to your family's taste. We had mussels in spicy marinara in Niagara for our 1 year. Ever since then I've tried to recreate the spicy sauce. I bet this would be a close match. Let me know how it works out for you Christie. Mussels in a spicy marinara sound delicious. Very creative! Thanks for participating this week. A delicious classic, looks and sounds great.